Property 1: Enjoy the Blue Ridge Mountains & the BLC, close to everything! Property 8: Panoramic Long Range Views off 2 Decks & Close to Everything! Swiss Chalet in Little Switzerland with unsurpassed mountain views! Property 11: Swiss Chalet in Little Switzerland with unsurpassed mountain views! Property 14: Mountain Stay with a View on Beech! Property 16: Mountain Stay with a View on Beech! Beech Mountain Ski-in/Ski-out with awsome deck views. 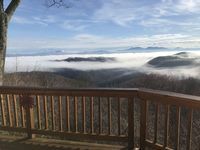 Property 24: Beech Mountain Ski-in/Ski-out with awsome deck views. Property 26: GORGEOUS Winter Bch Mt Chalet-- BEAUTIFULLY furnished! Beech Club Privileges! Slopeside is just steps to Beech Mountain Resort and Ski Village! Amazing Views! Property 27: Slopeside is just steps to Beech Mountain Resort and Ski Village! Amazing Views! Ski Chalet Condo on Beech Mountain Resort's SNOWBOARD TERRAIN PARK! Property 29: Ski Chalet Condo on Beech Mountain Resort's SNOWBOARD TERRAIN PARK! Property 34: Magnificant Round House w/ "Skyline Views!" Property 36: It's time for a Ski Trip! Stay close to the slopes! Property 43: Great Deck! Golf, Pool, Lake with Beach! Welcome to Mountain Life Living. Talk about LOCATION!! Property 44: Welcome to Mountain Life Living. Talk about LOCATION!! We thoroughly enjoyed our time there. It's a clean place that is exactly as advertised. The owner is quick to respond to messages.